Greenhouse Farming and Hydroponics: The solution to farming in a country with limited water resources? South Africa is a country with limited water resources and where access to land is an issue. With these limitations in mind, a task team from Casidra recently undertook a viability study on Greenhouse Farming (with Hydroponics as the backbone of this farming method) to see if this farming method can overcome these limitations cost effectively. 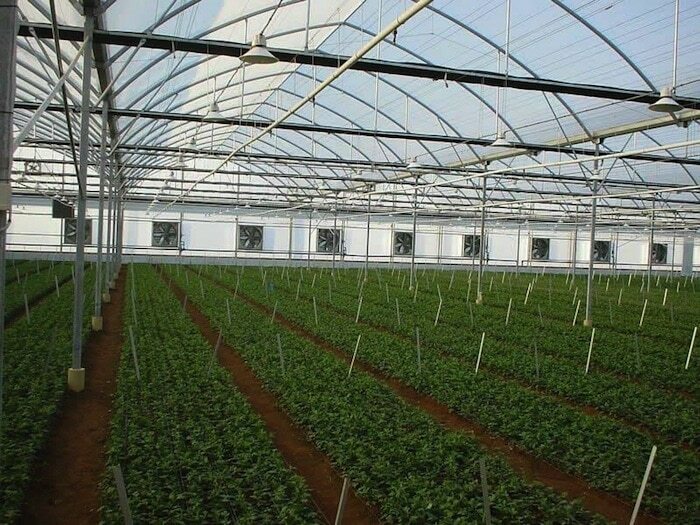 Greenhouse Farming entails farming under a cover, while Hydroponics is the philosophy to irrigate plants (normally by means of drippers) with nutrient enriched water. Hydroponics is derived from two Greek words, namely “hydro”, which means “water”, and “ponos”, which means “to work”. Therefore, hydroponics literally means “to work with water”. When farmers irrigate and feed their crops simultaneously through a solution of water and nutrients on an open field, it is called “Open Hydroponics”, and when used in an enclosed area such as a greenhouse, where the plants are grown in pots, it is called “Hydroponics”. Open Hydroponics takes the buffer capacity of the soil (N, P and K) into consideration when a fertilizer programme is formulated, whereas with Hydroponics it is assumed that the medium the plants are growing in has no buffer capacity and, therefore, all the nutritional needs are added artificially while irrigating. There are 16 elements that are regarded as necessary for plant growth, of which nine are macro elements and seven are micro elements. All but three of these elements are added daily to the plants as a solution. The formulation of plant nutrition in Hydroponics is essential because the solution should provide all the necessary nutrients in the correct ratio and at acceptable levels. For a plant to survive (and more so to grow and reproduce), all of the above is needed without fluctuations in pH. Using Greenhouse Technology and Hydroponics as a combined method of crop protection, nutrient and water supply, it is possible to irrigate and feed the plant at peak physiological stages during the day all year round. This will ensure the optimal uptake of nutrients and water during the day because the water supply to the roots is higher than the atmospheric demand of water (evaporation). This will ensure that the stomata does not close at unwanted times, which again will lead to maximum photosynthesis and cooling down of the plant. Through climate control, optimal uptake of nutrients and water will be ensured, which will lead to good crops (quantity and quality) and savings because the applications are more effective and sufficient. In a country where access to land is an issue and with limited water resources, Greenhouse Farming and Hydroponics could contribute to farming possibilities for people previously denied the opportunity, but we must remember that Greenhouse Farming and Hydroponics are a high management and cost-intensive method of farming and, therefore, potential farmers will need the necessary skills and access to capital before they venture into Greenhouse Farming and Hydroponics. Greenhouse Farming and Hydroponics do not provide a shortcut or any guarantees to success.